Can't believe how long the sun has lasted and we've been enjoying every minute of it. We have had such a lovely weekend sourcing loads of vintage goodies that will be up for sale this week. Sunglasses, floaty skirts and dresses..we went all out this weekend, we even had our legs on show :) Today we decided to spend all day in the garden lapping up the sun and blogging. Hope you all had a lovely weekend. 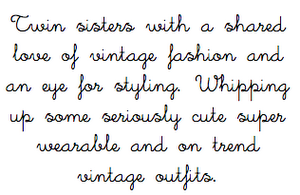 Hi Annies, you do have a super cute blog. Your vintage pieces are so great. I loooove your pastel color skirts and trousers. Hope to see more indeed. I think you ladies are doing such a wonderful job! I have just started sourcing vintage and am mainly selling from my own personal collection at the moment and you are very much my inspiration. found the blog with Chictopia! and i am in love with the style you both got! just one word...FANTASTIC! Twins style ! I really love this one !